Torbangun (Coleus amboinicus Lour) is a tropical plant from the Lamiaceae family. Torbangun leaves have a distinct aroma. Torbangun leaves have been traditionally used as a medicinal plant in North Sumatra, Indonesia. Bataknese lactating women in North Sumatra consumed torbangun leaves after giving birth with beliefs that it could increase their breast milk production (lactagogue), and that the leaves can function as anti-fungal and/or anti-bacterial, analgesic, to reduce blood cholesterol, and clean the human uterus. However, scientific evidence on this traditional herb is limited. This research was conducted to: (1) determine the leaf N, P, K, Ca and Fe in different position along the plant and the leaf age as to diagnose the secondary metabolites content of torbangun leaves, and (2) determine the relationship between N, P, K, Ca and Fe leaf concentrations with their metabolite production. The results of the study showed that: (1) the best leaf position and age to determine of the need of N, P, K, Ca and Fe nutrients are on the 3rd leaf position of 5 months-old plant (2) There was a positive correlation between leaf K concentrations with shoot dry weight, Ca with PAL activity, and Fe with total saponins on the 3rd leaf position of 5 months-old plant. Keywords: Coleus amboinicus Lour, torbangun, nutrient, correlation test, secondary metabolites. Agus, Z. (2005). Anemia gizi pada perempuan pekerja dan program penanggulangannya. Medika 31, 266-268. Alfitra, P., Setiawan, B., and Damanik, R. (2010). Supplement drink formulation from Torbangun leaves (Coleus amboinicus Lour) for premenstrual syndrome woman). Indonesia Journal of Nutrition and Food 5, 95-102. Andriani, E., Damanik, R. and Ekayanti, I. (2012). Correlation of Torbangun leaves (Coleus amboinicus Lour) powder capsules suplementation on blood pressure and cholesterol. Jurnal Teknologi Industri Boga 3, 14-22. Apriyantono, A., Fardiaz, D., Puspitasari, N. L., Yasni, S., and Budiyanto, S. (1989). ¨Petunjuk Laboratorium Analisis Pangan”. IPB Press. Beard, J. L. (2006). Interpretation of serum ferritin concentrations as indicators of total-body iron stores in survey population: the role of biomarkers for the acute phase response. The American Journal of Clinical Nutrition 84, 1498-1505. Chang, C. C., Yang, M. H., Wen, H. M., and Chern, J. C. (2002). Estimation of total flavonoid content in propolis by two complementary colorimetric methods. Journal of Food and Drug Analysis 10, 178-182. Cheng, G. W., and Breen, P. J. (1991). Activity of phenylalanine ammonia-lyase (PAL) and concentrations of anthocyanin and phenolics in developing strawberry fruit. Journal of the American Society for Horticulture Science 116, 865-869. Damanik, R., Damanik, N., Daulay, Z., Saragih, S., Premier, R., Wattanapenpaiboon, N., and Wahlqvist, M.L. (2001). Consumption of bangun-bangun leaves (Coleus amboinicus Lour) to increase breast milk production among Bataknese women in North Sumatera Island, Indonesia. Asia Pacific Journal of Clinical Nutrition 10, S67. Damanik, R., Wattanapenpaiboon, N., and Wahlqvist, M. L. (2004). The use of a putative lactagogue plant on breast milk production in Simalungun, North Sumatra, Indonesia. Asia Pacific Journal of Clinical Nutrition 16, S87. Damanik, R. (2005). Effect of consumption of Torbangun soup (Coleus amboinicus Lour) on micronutrient intake of the Bataknese lactating women. Medika Gizi 29, 68-75. Damanik, R., Wahlqvist, M.L., and Wattanapenpaiboon, N. (2006). Lactagogue effects of Torbangun, a Bataknese traditional cuisine. Asia Pacific Journal of Clinical Nutrition 15, 267-274. Damanik, R. (2008). Torbangun (Coleus amboinicus Lour): a Bataknese traditioal cuisine perceived as lactagogue by Bataknese lactating women in Simalungun, North Sumatera, Indonesia. Journal of Human Lactation 25, 64-72. Dangcham, S., Bowen, J., Ferguson, I. B., and Ketsa, S. (2008). 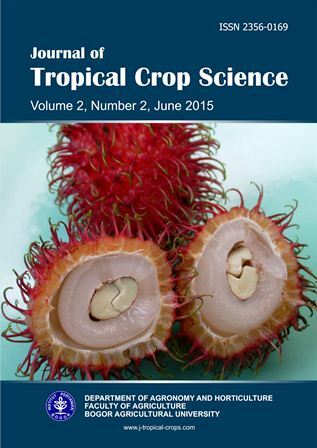 Effect of temperature and low oxygen on pericarp hardening of mangosteen fruit stored at low temperature. Postharvest Biology and Technology 50, 37-44. Department Kesehatan Republik Indonesia. (1989). ¨Material Medika Indonesia Jilid V¨. Direktorat Jendral Pengawasan Obat dan Makanan (Dirjen POM). Devi, M., Syarief, H., Damanik, R., Sulaeman, A., Setiawan, B., and Dewi, R. (2010). Supplementation of Torbangun leaves (Coleus amboinicus Lour) in reducing the complainst of pre-menstrual syndrome (PMS) among teenage girls. The Journal of Food and Nutrition Research 33, 180-194. Ekawati, R., Aziz, S. A., and Andarwulan, N. (2013). Shoot, total phenolic, and anthocyanin production of Plectranthus amboinicus with organic fertilizing. Buletin Litbang Tropikal 24, 93-100. Fathonah, D., and Sugiyarto. (2009). Effect of IAA and GA3 Toward the Growing and Saponin Content of Purwaceng (Pimpinella alpina). Bioscience 1, 17-22. Jones, J.B. (1998). ¨Plant Nutrition Manual¨. 149 pp. CRC Press. Khattak, M. M. A. K., Taher, M., Abdulrahman, S., Bakar, I. A., Damanik, R., Yahaya, A. (2013). Anti-bacterial and anti-fungal activity of coleus leaves consumed as breast-milk stimulant. Nutrition and Food Science 43, 582-590. Khattak, M. M. A. K., Taher, M., Damanik, R., Abdulrahman, S., Bakar, I. A., and Yahaya, A. (2013). Torbangun (Coleus amboinicus Lour) extracts affect microbial and fungus activities. Journal of Nutritional Therapeutics 2, 194-200. Liferdi, Poerwanto, R., Darusman, L. K. (2005). Perubahan Karbohidrat dan Nitrogen Empat Varietas Rambutan. Journal of Horticulture 16, 134-141. Mardisiswojo S., Rajakmangunsudarso, H. (1985). “Cabe Puyang Warisan Nenek Moyang”. 1st edition. 392 pp. Balai Pustaka, Jakarta. Mepham, T. B. (1987). ¨Physiology of Lactation¨. 207 pp. Open University Press. Prajonggo, T. S., Djatmiko, W., Soemarno, T., Lunardi, J. L. (1996). Pengaruh Sauropus androgynus (L.) Merr terhadap gambaran histologi kelenjar susu mencit betina yang menyusui In “Prosiding Kongres Nasional XI ISFI”, pp. 14-15. Rivero, R. M., Ruiz, J. M., Garcia, P. C., Lopez-Lefebre, L. R., Sanchez, E., and Romero, L. (2001). Resistance to cold and heat stress: accumulation of phenolic compounds in tomato and watermelon plants. Plant Science 160, 315-321. Sims, D. A., and Gamon, J. A. (2002). Relationship between leaf pigment content and spectral reflectance across a wide range of species, leaf structures and development stages. Remote Sensing of Environment 81, 337-354.